Once a year we get the opportunity to participate in a week that emphasizes our call to the Great Commission. Missions Week 2017 will be March 8-12. 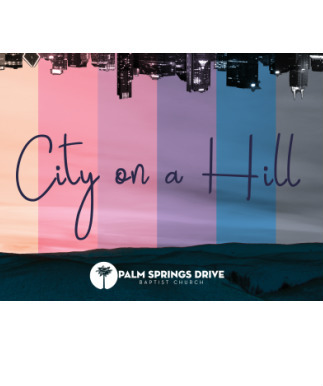 This year's theme is "City on a Hill." We believe that our global missions program allows us to be a City on a Hill burning brightly for the whole world to see. We are very excited about all the opportunities we will have to learn more about global missions and get to know our missionaries to Whales, Ethiopia, and the Philippines. Wednesday night our missionaries will compete against our elementary and middle/high school students in a game of Family Feud. Our Altamonte Christian School elementary choir will have a special song for us. We will also have an ice cream social. Thursday night will include a fun night getting to know our missionaries with The MIssions Tonight Show. Jimmy Fallon and the Roots will not be in attendance, but it will prove to be a good show. We will also have a time for cookies and coffee. We would love for you to bring some of your favorite cookies! Saturday will include a picnic at Sanlando Park at 4:30pm. We will have some fun with our missionaries and get to know them better in a comfortable setting. On Sunday, we will have donuts with our missionaries at 9:30am. Ladies will be in the auditorium and men will be in the gym. Following the service, we will have our missions banquet lunch. Tickets for the lunch will be $3.